Scrangie: OPI Mini Halloween Kit for 2009: Tattoo Ta-Boo! I love Halloween.... Oh yes. Halloween rocks. HALLOWEEN!!! WOOHOO! Anyway, OPI usually indulges my Halloween obsession each year by releasing either Halloween-themed polishes or a mini nail art set like this. Here's the set all together. It comes with four polishes and some temporary tattoos. I can add them to my collection! Tattoo You Want Candy? Orange creme. This is a medium orange creme, I think they release this color every year for Halloween. 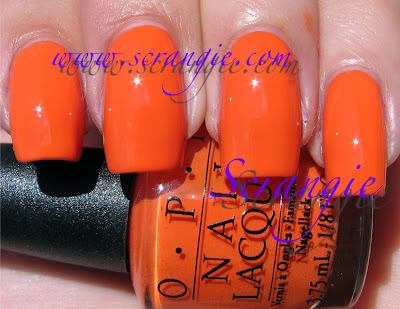 I don't remember which OPI Orange this is a duplicate of, but I think they just re-name it every year. Witch Arm? Black creme. This is almost a one-coat black. Very smooth. I Love Mummy. White creme. Also very opaque. I did two coats and it looks perfect, that's rare for white. I'm thinking this is Alpine Snow. Glow-Ink In The Dark. Light blue/purple glow in the dark. The star of the collection. This is a very sheer polish so you can use it as a glow in the dark topcoat without completely covering the color underneath. The glow on this is pretty strong, but not as strong as Wet N Wild Fantasy Makers Night Glow. I tried for about an hour to get a picture of it in the dark, but I was unsuccessful. I think perhaps The Nailphile had a picture of the glow? I know for sure *someone* did, I will have to double check. Anyway... This is a really interesting looking polish. It looks like it has shimmer or glitter particles, but they're really just speckles of the phosphorescent material that makes it glow. View this full size to see what I mean! It's really cool. The formula on these is great. Pretty much your standard OPI formula. I did two coats of all the opaque polishes and five coats of Glow-Ink In The Dark. They all dried very quickly, even my five coats of Glow-Ink In The Dark. The only application issue with these is that they're mini and therefore have mini brushes. It can be hard to keep enough polish on the brush for a smooth application. Other than that, no problems. The back of the box gives some instructions and ideas for Halloween nail art. I haven't tried any of the designs, but they all look very easy to do with the included polishes. Normally I think OPI's names are witty and cute, but these make me groan. I know I've said this before about something, but these are worse than ordering at Denny's. They're so cheesy, I feel embarrassed typing them out! Tattoo You Want Candy??? Witch Arm?? I hope no one asks me what polish I'm wearing. I might cry. But, overall, it's Halloween-themed so I automatically love it. This would be an ideal set for someone who wants to experiment with these colors and doesn't want to commit to buying full bottles. Black, white, orange and glow in the dark are 'normal' colors for me, so having them in mini size in a Halloween decorated box is very appealing to me. Would also make a great gift. I wish more companies would do Halloween sets! An OPI bottle in mini form is just too cute! I love the look of Glow-Ink. I really like the color on that glow in the dark one, even in normal light =) I picked up a China Glaze glow polish on clearance but haven't used it yet, I guess now is the time! I kind of want Glow-Ink! I agree, the names are really lame! I get the halloween set every year. I almost picked up an orange bottle today while I was out, but held off because I knew this would be hitting the shelves soon enough. I just keep using up the little orange bottles haha. I'm very excited for the glow in the dark blue. It looks neat even without the glow aspect! Haha, I know what you mean about the names. The orange reminds me of Heeeere's Jack! I'm sure it's the same color with a different name. I think the orange is Osaka To Me Orange, and black is Black Onyx, iirc. The white's always Alpine Snow. I love the new GITD each year, but I think their repackaging of old orange/white/black is getting old. Thanks for the swatches! I definitely need all four! China Glaze has a Halloween set out called Spellbound. I'm not sure if its new for this year or just a re-release. Its White Out, Liquid Leather, Ghoulish Glow and Spellbound, a glitter topcoat. I like Glow-Ink, I may have to pick up this set just for that color. I love Halloween! I gotta say the white looks fantastic. I can't wait for Halloween!! I agree with you about the mini brushes. When my nails are at their longest, I find it almost impossible to paint my nails with minis. I have the "Get Inspidered" set from last year, and it has the same orange and black polishes, except they are called "Here's Jack" and "Spiderella" respectively. I guess orange and black are the standard Halloween colors, so I am not surprised. I just ordered these today, I have gotten them for the past three years I just can't resist these mini halloween collections, so cute! I'm dying to get this collection on my nails...does anyone know where it can be purchased???? I have to find Glow-Ink In The Dark! Even if it was not all wonderfully glowy, the color is amazing! Hope your nail is doing alright after last night! And in Germany, Halloween is not really celebrated. There are a few costume parties, but most people don't even decorate their houses, there are no pumpkins, no ghosts, no bats, no witches, it's so depressing. Someday I'm gonna go for a short holiday to the USA, just 2 days before and after Halloween, to enjoy all the decorations and stuff. I bought the halloween nail set from OPI last year and I bought this year's as well. I really like the mini bottles :) they are so cute. I love the glow-in-the-dark one. Do you know if OPI made a full-size bottle of it or to get that colour do I have to purchase the mini set? OMG i just got this set today in the mail and here you are swatching it!!! Can't wait to use them, I LOVE halloween! Lurve these colors!!! Especially the last one, too bad none of these match with my halloween costume, I've got it planned out and everything! lol I'm a costume freak! I just love this little kit. I bought the Color Club Halloween mini's. The bad thing in buying these kits is the repeated black and white polishes. Can't they do other colors? i love your swatches!! i would love to see the new holiday lippmanns if you have them!! love the swatches! as far as halloween, i just picked up a wet n' wild one from cvs on a whim; its a clear base with darkish rainbow bar glitter. so excited to try it out! i have this kite but it dosent glow in the dark.